With the Jewish Holidays at their end, I must say that I really did enjoy them, but spiritually and wine wise! I have been slowly but surely changing over my collection from wines that I thought I liked to wines I actually do like. Sure, I have a few duds here and there, but for the most part, I think I have thinned the ranks of the unwanted. Years ago – I blindly bought whatever red reserve Yarden wines the late Daniel Rogov scored a 92 or higher, and to his credit it was a grand time for a bit. But sadly before he passed, his golden touch, in terms of picking the perfect Yarden Reserve red was losing its aura. To be fair it is not a detriment to the man I truly respected. It is simply that my palate and interest have moved so starkly from the overripe notes of old, that I have finally broken down and written my Dear John letter to many Israeli wines. As I stated 9 months ago in my year in review and ahead, I stated that I would start to track wines that I find overly ripe in style, whether it comes from Israel or anywhere else. I have been doing that in my wine notes, but I and finding less and less of them, simply because I am turning over my library in the direction of wines like Tzora, Yatir, and so on. To be fair, wineries are making wines like this because that is what the public wishes, or so they say. 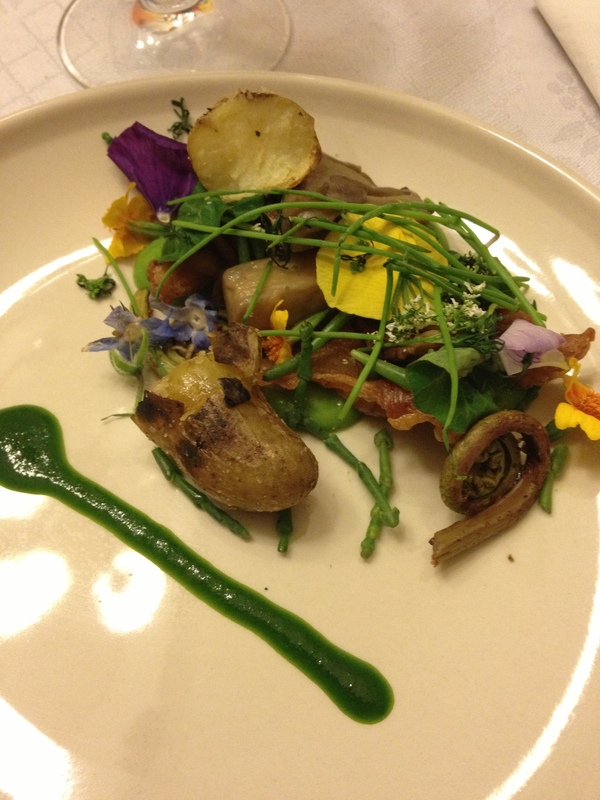 I understand that a palate is a hard thing to come by, and that it may well be an evolutionary road for many. Still, there is a thing called nuance and then there is a thing called a 2×4. To create wines that are so obtusely in your face – one has to stop and wonder if the winemaker is actually unwilling to trust his wines to you. Maybe it his/her way of saying – here I dare you not to taste something in this wine! 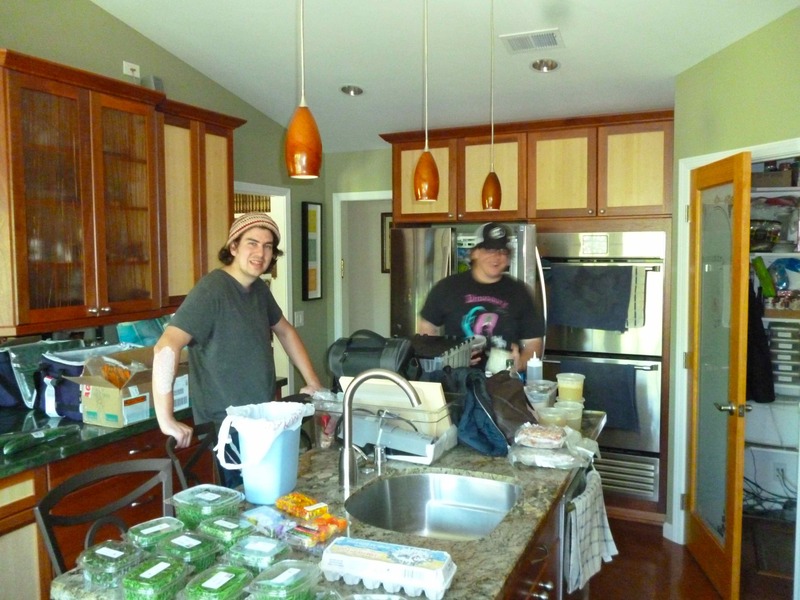 Mocking you as the winery takes your money and you are left with that aching feeling that is more akin to a used car lot than a culinary experience. So, I thought it was time to publicly publish my Dear John letter to wines from Israel or elsewhere that continue to cater to the LCD (least common denominator) – and make wines that only a dead person could miss notes in. I have to be honest, for the longest time you were a wonderful accompaniment to my weekend dinners. However, in these past 5 years, I cannot help but think that we have drifted apart. Oh come on, do not flutter those sweet and cloying tannins at me, you know how I hate that so. I wish I could say it is me and not you, but I would be lying. This is all on you! This is not about you or about me “winning or losing”, you know I have lost so much over the years when I happily gave away bottles of the 2004 Ortal Merlot and so much more. There is no denying that we have changed so much, you continue to be so sweet, of course, but what I finally realized is that you are also so empty. Sure you have those wonderful structural qualities, that we all look for in a companion, but the rest is hollow, no stuffing, no meaning, just a flat and empty being. I tried so hard to make it work, to ignore my wine friends, telling them that it was just a bad night or a really bad weekend, like that bender in December. Sadly, it always turns out the same way when I wake from another night of debauchery, I am thankfully a bit lighter of you and you are always the same – big, bold, loud, and empty! So, I am happy to say I think I am rid of you from my cellar. I have worked hard to empty it of your kind and thankfully, I can now say that you are in my past. 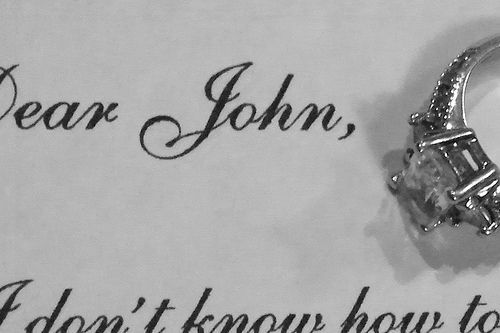 I waited too long to write this letter, for that I am sorry to you and my guests. However, going forward I know that I have made the correct decision and wish you and those wineries all the best. I even have a lovely new moniker for you DJL – if you see that on a note I write, you will know that you have found a wine you will truly come to love. For me, it will be a badge of shame. I am that the blog has been quiet for a bit of time here and there, but hopefully I will be back into the swing of things soon. I wanted to post three wines that I loved and had recently and ones that are still available here and there – even given two of their ages. The 2005 Hagafen Zin can still be purchased from Hagafen Winery’s library collection. The Galil Yiron 2007 is available at some shops here and there – this one requires effort to still find. The 2012 Petita is available everywhere that good kosher wine is sold. The nose on this garnet colored wine is hopping with an expressive and intoxicating smokey perfume of licorice, spice, tar aromas, and animal fats. The mouth on this medium to full bodied wine is truly explosive with now integrated mouth coating tannin, rich mouth feel and concentration of black cherry, ripe blackberry, ripe plum, and raspberry, followed by tart fruit, sweet oak, softening tannin, sweet herb, and nice acid. The finish is long, spicy and expressive with green notes, eucalyptus, graphite, dirt, tobacco, and oriental spices – BRAVO! Start drinking up – this wine has is at peak or very close, and after that who cares – the fun starts to abate, get it while the going is fun! The nose on this lightly browning wine is filled with rich fruit, ripe strawberry, along with sweet cedar, brown sugar, and great spice. The mouth on this medium bodied wine is ripe and concentrated with layers of ripe blackberry, black plum, red fruit, ripe jammy boysenberry, all wrapped in a cocoon of sweet cedar and mouth coating tannins. The finish is long and rich with great acid, control, and a bounty of fruit, all leading to a chocolate, vanilla, and spice crescendo, with cinnamon, cracked pepper, and nutmeg. DRINK NOW and do not hold on to these a second longer. When opening it, give it 30 minutes and then finish there and then! This wine sure is fun, the brown sugar, cedar, chocolate, and dark ripe black fruit all mingle with crazy vanilla and brown sugar on a long and sweet finish – BRAVO!!! This past Passover was such a real kick, we shared food and wine and time with friends and family throughout the entire Passover and it was such a real treat. For the evening of seventh day of Passover, we were alone and I made some braised shoulder roast and my wife had some brisket leftovers from the Shabbos meal. 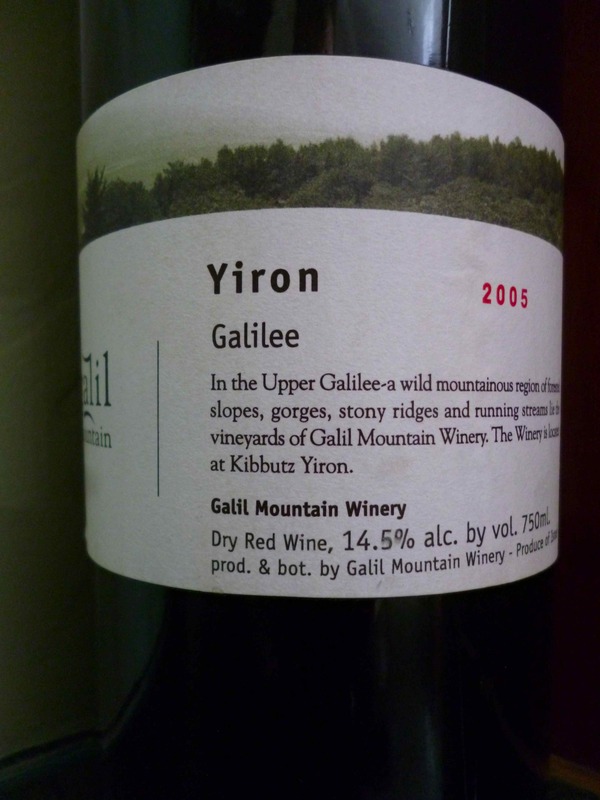 To enjoy the meal, I opened a bottle of the 2005 Galil Mountain Yiron, a wine that has let me down twice recently, but not on that day! WOW! That wine is insane! Rich, layered, and full of tannin that coats and dusts your mouth – really nice, but please beware – this wine is throwing TONS of sediment, hand painting sediment! The next day was a real treat! 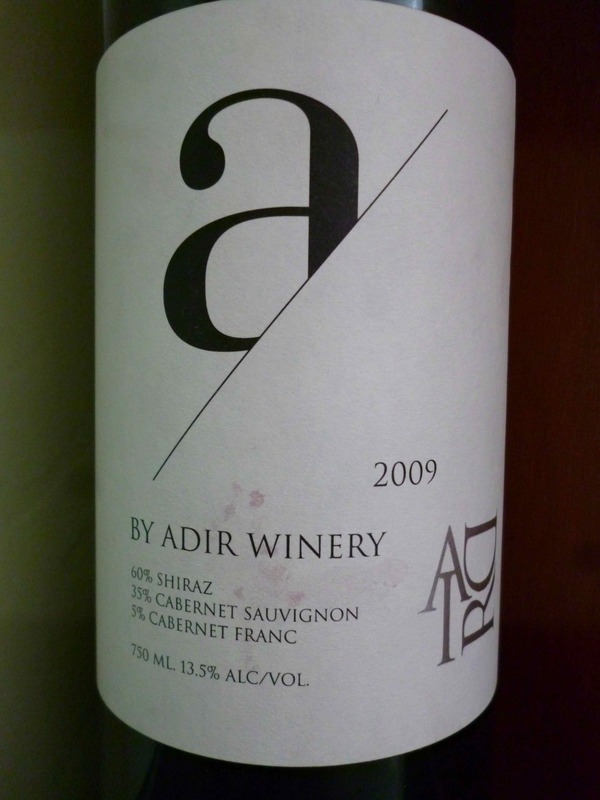 We had friends come over and one of them shared a bottle of 2006 Adir Cabernet Sauvignon, that he received from another wine aficionado – thank you so much Rafi for sharing!!! We paired that with a bottle of the 2009 Adir A, a blend of Shiraz, Cabernet Sauvignon, and Cabernet Franc, a bottle I bought in Jerusalem from my guys: Gabriel Geller and Chalom – partners of the Wine Windmill. To be fair, we started off with a bottle of 2007 Yarden Chardonnay and while it was not flawed, or a dud, it was way too far oak driven and lacking in fruit and oak reaction. After we moved that off the table, we opened the two Adir wines and then we opened a bottle of the 2008 Covenant Red C – a wine that was so apropos for the whole splitting of the Red Sea thing that happened on the same day, some 3000 years ago! 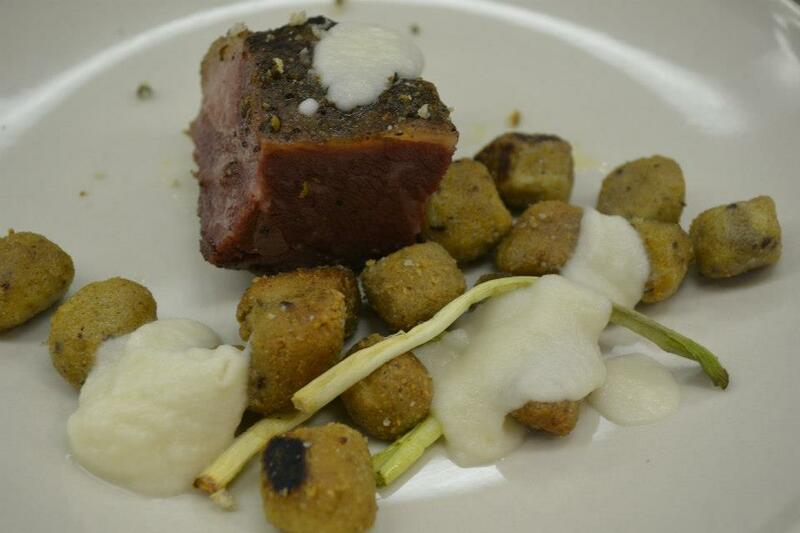 Food wise, we started with the herb encrusted gefilte fish loaf and side dishes that we made and bought. For the main course we had some great vegetable kugel, and a hunk of rib roast that we cooked slowly and simply using Alton Brown’s Rib Roast recipe. We had some simple dessert and paired it with some lovely Adir Winery Port Blush. I have friends who call it Port Bluff as it is really only made from late harvest chardonnay grapes and some sugar, but who cares! Tons of French wines use Chaptalization, and in this case the wine is actually quite enjoyable. The added sugar or late harvest fruit is clearly apparent, but the sherry like flavors or almond and nuts either turn you off or captivate you. To me Sherry wine is awesome and unique and that makes it interesting to me, but sure many find it offensive – their loss.